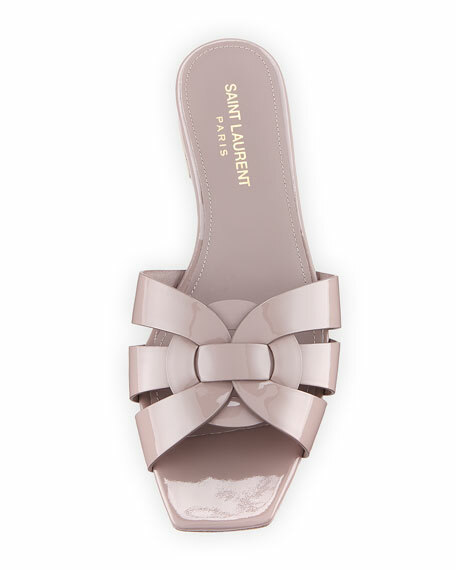 Saint Laurent sandal in patent leather. EXCLUSIVELY AT NEIMAN MARCUS Aquazzura metallic synthetic leather and suede sandal. Flat heel. Strappy vamp. Leather lining. Slide-on style. Handmade in Italy. Loeffler Randall "Eveline" slide sandal in metallic lamb leather features delicate straps. Flat heel. Crisscross vamp with knotted bow. Leather lining and sole. Made in Brazil.